These adorable magnets are from the mind of my sweet Sis-in-law Hannah. I just love this idea. 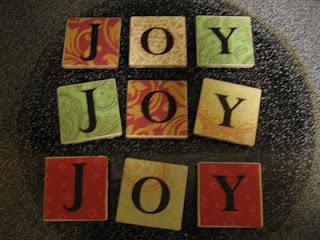 She bought ceramic tiles and then sent craft paper through her printer to make the letters. 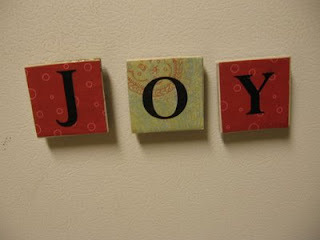 She used Mod Podge to glue the papers onto the tiles and then glued magnets on the back. She used them for her neighborhood gifts along with the scripture Luke 2:10-11. "And an angel said unto them, fear not, for, behold, I bring unto you good tidings of great JOY, which shall be unto all people. For unto you is born this day in the city of David, a Saviour, which is Christ the Lord." What a perfect way to bring the spirit of Christmas to your friends with very thoughtful handmade gift! Thanks Hannah!! what size are the tiles? Hannah used 2'' tiles that were connected in a sheet like you would use for a backsplash. She just cut them apart. I hope you don't mind if I feature this idea in my week long Holiday Gift Extravaganza! It will post on Wednesday! Come stop by and check it out!